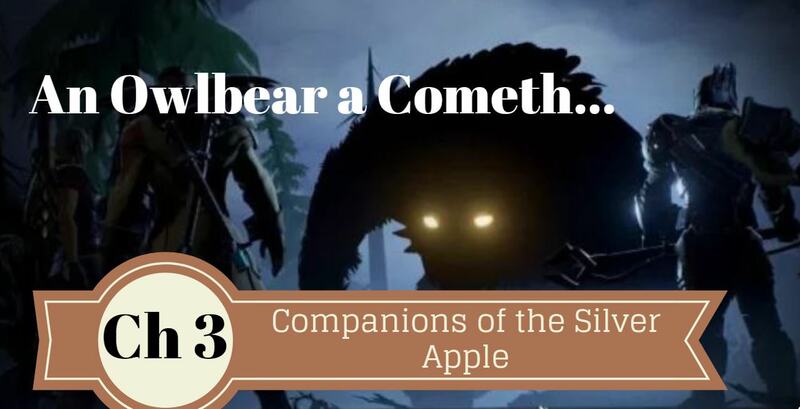 Companions of the Silver Apple their Quest Continues! The Companions of the Silver Apple have now agreed to find a way to procure a heavily guarded magical item. They have no idea how well guarded it really is.....or the repercussions their actions are about to have. The Silver Apple is held in one of the most famous, mystical and mysterious taverns in all of Faerun the enigmatic Moonstone Mask! The Companions currently Include L'lyssa the Halfing Theif, Anorak the Elf Wizard, Percy the Human Fighter,. They are about to be put to the ultimate test of wits, deceit and outright trickery. The party agreed to procure one of the apples and set for the Moonstone Mask for Gunderen Rockseeker. The hope being that Rockeseeker could become a patron of sorts of the new fledged party. 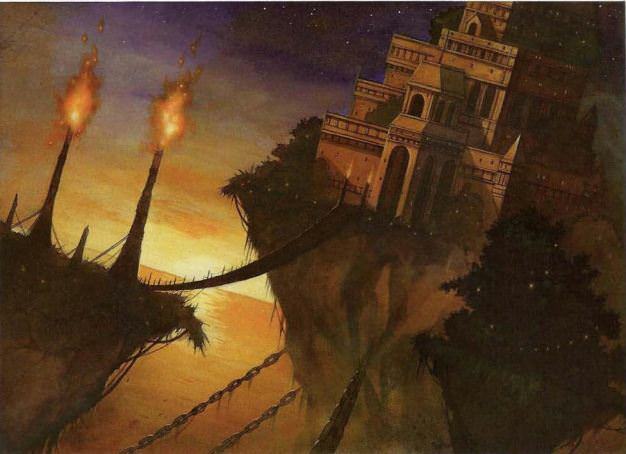 Not far from where they met Gunderen was a portal that connected to a floating island that held the Infamous Moonstone Mask Inn upon it. The floating island was held in place by two impossibly large chains. The party traveled into the portal and within an instant found themselves on a floating island. They entered the Tavern and entered a lavish setting. 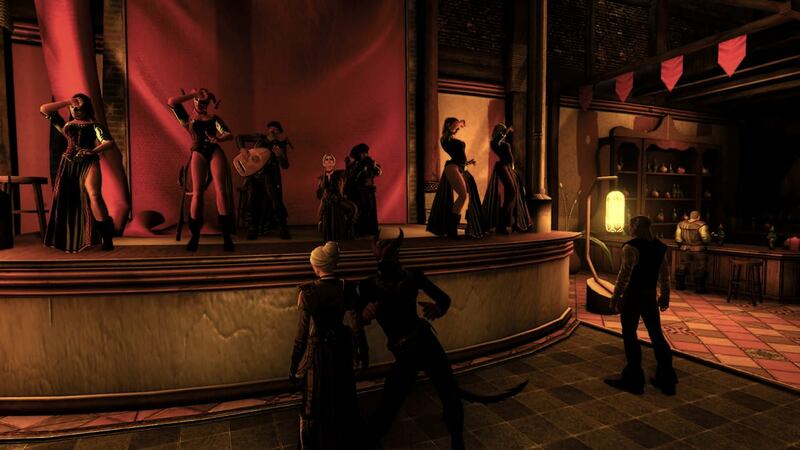 Wealthy patrons sat about in tables with masked waitresses floating about skillfully taking orders. Anorak ordered an ale from the bar only to balk at the exorbitant price. He none the less swallowed his shock and paid the bar keep. "Where is the tree?" Percy asked a little to loudly for Anorak's comfort. They scanned the room and could see that their were rooms beyond this immediate bar. However, large armed guards stood at the entrance. They no more entered when they were beckoned over by a familiar face. The same Tiefling that had given them a warning about the dwarf. "Ahh I see you all survived your encounter with those assassins. Good good, I presume by your appearance here that you have now come to retrieve one of the Silver Apples from this Inn. Let me give you some advice.........Run". Percy bristled at the notion of running. "Why would I run from a bar? I love bars." "Ahhh my most non astute friend let me help you understand your present circumstances. The waitress of this establishment wear masks that allow them to read thoughts, including those of yourself and your fellows. To add to your problems this Inn is filled with torches that can launch spears of fire at any who go against its owners wishes. To make it worse its full of mercenaries hired to protect it,..."
As the Tiefling calmly informed the party of their circumstances a group of mercenaries began assembling in the bar room. The party didn't even have time to react as the mercenaries swept them up and tossed them out of the front door. They landed unceremoniously out in the dirt. "Well that did not go well" observed Anorak. The group took a moment to brainstorm ways of sneaking into the Inn and decided to look for a back entrance. Upon sneaking in L'lyssa was almost immediately caught by a laundress doing laundry in the back. She picked up L'lyssa with one arm and walked her out of the Inn. While appearing as normal middle aged woman the laundress seemed impossibly strong as she tossed L'lyssa out. Seeing the rest of the party she glowered at them with eyes that seemed to flash with power. Anorak intervened on L'lyssa's behalf and explained their mission to retrieve the apple to the laundress. The laundresses face softened, yet Anorak could not help but shake the feeling that behind her human mouth was a massive set of jaws. L'lyssa did a perception check on Amundra but could only see her to be a normal human woman. Anorak ran a arcana check to learn that some powerful creatures could disguise themselves as human and they could be either good or evil. While the party debated whether this super strong laundress was good or evil she introduced herself. "My name is Amundra, and I have served the Moonstone Mask for sometime. It has been good place to me to further my goals. I will not openly betray the mistress of this tavern by giving you one of her precious Silver Apples. However, I sympathize with Gunderen and believe his quest can do a great good. I will tell you that the mistress answers alone to the goddess Mystra who has seemingly disappeared from the world. Very little but an order from Mystra herself will cause her to give up one of the apples. While such a thing is certainly unlikely to occur I believe I can help you. I am skilled with alchemy and I will give you two potions." She pulled out two glowing vials from her dress. "This potion will allow you to change your form and voice into anyone or anything you desire for 5 minutes." She then help up a potion that sparkled with glowing blue lighting sizzlying inside. "This potion will allow you to project yourself 50 ft away. Others will be able to see and hear you and you will be able to see and hear them. However, spells and magics will not be able to travel from your projection into yourself." Percy looked at the potions puzzled. "How do these potions help us steal the apple?" The laundress smiles and the whole party felt a wave of nausea sweep over them as the smile did not seem quite human. "That my dear, is for you to figure out." She then left the group to their thoughts and many thoughts were had. 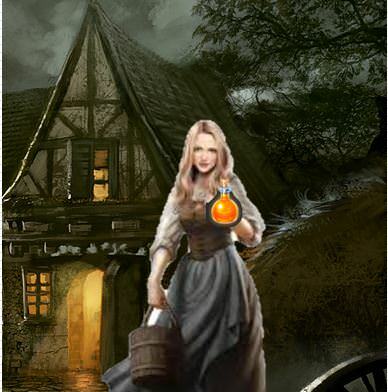 Finally it was decided that L'lyssa would use the shape change potion to take on the aspect and voice of Mystra and then the projection potion to bring her image into the Inn where she would demand that a Silver Apple would be tossed outside the front door. 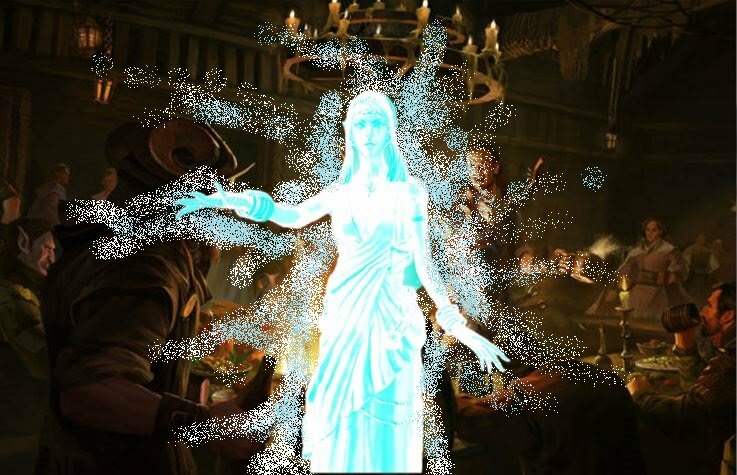 They consulted Anorak's religious (Rolled an 18 religious check) knowledge to learn that Mystra had the countenance of an ethereal small girl with a powerful voice. L'lyssa was chosen due to her admirable skills in deception as well as the performing arts. Though it still made L'lyssa nervous. L'lyssa thought about the aspect of Mystra and took the shapechange potion. Immediately she was transformed into that of slighly transparent small girl. "Hurry we only have 5 minutes" urged Anorak. L'lyssa took the other potion and her eyes could see that she was now inside the Inn. She rolled for performance getting a 20 with bonuses. Patrons began screaming in shock and flinging themselves to the floor. She called out "Lisset, Lisset come here this is Mystra". The terrified owner of the Inn appeared and threw herself to the floor at the aspect of Mystra's feet. "I have a need for one of your silver apples. Throw it out of the door and ...DO NOT WHERE where it goes". "yyyyyes mystra" the formally confident owner of the inn responded. "Thank you for your service to me, it will be rewarded"
"OoooF Of course my Lady" Lisset said. Then the aspect faded. The party waited a short time only to see a Silver Apple glowing with magical hue tossed out of the front door. They hurried over and scooped it up. They could hear a major commotion inside the Inn. "I think we should get out of here" Percy opined. The party began to head toward the portal. "WAIT!" the group turned to see the Tiefling strut out of the Inn. "I am not sure how you amateurs pulled that off, but that apple is MINE!" "I don't know what your talking about" Lied L'lyssa rolling a deception check of 15. "I don't care if you have it, or not", the Owl Bear coming through that portal will ensure that where ever it is, it will be mine." 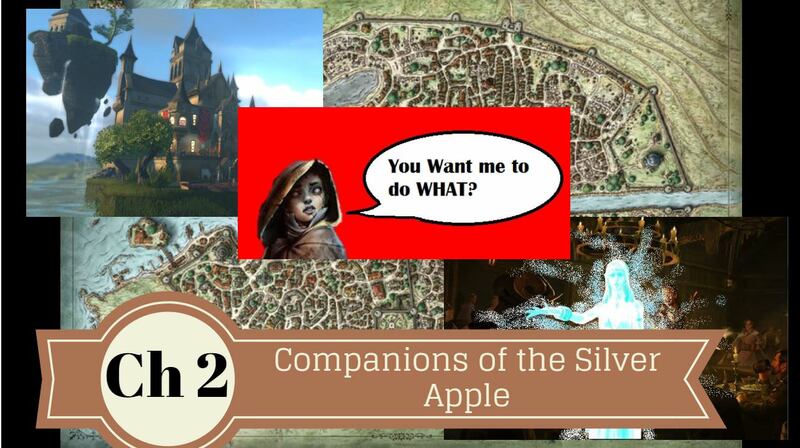 What will happen to the Companions of the Silver Apple next? Will they survive the Owlbear? Find out in Chapter 3. Chapter 3: THE OWL BEAR LOOMS!